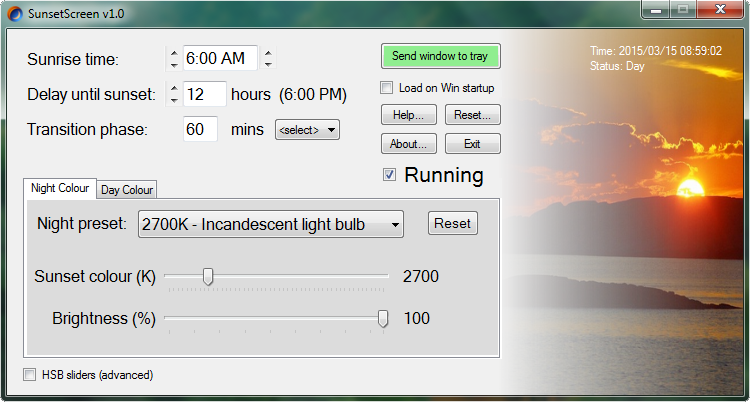 SunsetScreen is a free Windows app (for personal use) which helps take the glare off your your screen in the evening. Scientific research has shown that melatonin - the chemical the brain makes late in the day - is reduced when exposed to blue light. By tempering this blue light, it becomes easier to wind down properly at night, and thus have a more restful sleep. In the evening and at night, computer screens are starkly blue compared to the 'natural' orange glow provided by indoor lighting. With SunsetScreen, it's easy to dim our screens to an orange-ey hue to match the colour of the indoor lighting we use. Additionally, scientific research has found that along with over-bright indoor lighting, over-bright screens can affect the production of melatonin - the chemical which helps us to turn off at night to get a restful sleep. Programs such as F.lux partially solve the problem, but in the winter, I found the sunsets came too early. This caused F.lux to darken the screen early too. Just because it's dark outside early, that does not mean the human body clock revolves around the winter's schedule. Many, perhaps most people find considerable benefit to extra light during the day during the darker seasons, and if this extends to your laptop, tablet or computer screen, then we should allow that! Morning larks, night owls and even those who work night shifts will benefit from using SunsetScreen because their sleep cycles are hours apart from each other. SunsetScreen can be tailored so you can set the sunset and sunrise times appropriately to match your sleep rhythm. We should also be able to define the colour of the filter by hue, saturation or brightness if need be. This way, we can match the colour more precisely to the illumination by the light bulbs we have in our houses. Although dimming the amount of blue light is most important, the overall brightness may also be dimmed too if you so wish. Set the sunset time precisely. Set the sunrise time too. Choose by colour temperature or by HSB for a precise colour. Transition from one phase to the other gradually. Automatically resides in the tray so it keeps out of your way. Loads automatically at Windows startup if you wish. Instantly turn off SunsetScreen if you need to do colour sensitive work. Choose from a range of presets, and reset to default if things go wonky. Small, fast, elegant and easy to use interface in less than a megabyte.